What Makes A Mineral A Gemstone? 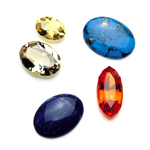 There are over two hundred recognised gemstones. Most are minerals and are cut from naturally occurring crystals. To qualify as a gem, the specimen should be hard and tough to resist scratching and have beautiful clarity, colour or ‘fire’. Value is based on rarity and rare quality. As mentioned, gems appear coloured due to some of the white light being absorbed within the minerals structure. Most gems are coloured by a limited number of metals present either as impurities, as in Allochromatic gems or as essential constituents of the atomic structure, as in Idiochromatic gems. The most common minerals affecting colour are; Chromium, Iron, Manganese, Titanium and Copper. 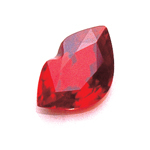 It is Chromium which produces the intense red of Ruby and the brilliant green of Emerald. In Garnet, Spinel, Sapphire, Peridot and Chrysoberyl it is Iron that is responsible for the more subtle red, blue and yellow colours. 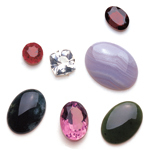 The best Sapphires are coloured by both Titanium and Iron whilst copper is responsible for the blue and green of Turquoise and Malachite, and Manganes the pink of Rhodonite. Some minerals give us more than one gem type. This is because the impurity, which is only a minute amount, is not always the same and may even be a combination of impurities. The interaction of the impurities and the atomic structure will also have an effect on colour. For example, the mineral Corundum, which is Aluminium Oxide, is colourless in its pure form, whereas if it contains Chromium it becomes the rich red of Ruby, if it contains Titanium it becomes the intense blue of Sapphire. Aquamarine and Emerald are different colours of the mineral Beryl, which can also be orange, yellow and green. 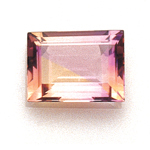 Quartz displays a profusion of colours, patterns and optical effects unsurpassed by any other gem – purple Quartz is Amethyst, yellow is Citrine, brown is Smoky Quartz (Cairngorm) and pink is Rose Quartz. Agate, Tiger Eye and Aventurine are some of the Quartz gems that display many unusual effects and colours.